CottageBLOG: Cupcakes are all the Rage! Have you noticed all the cupcake rage going on? 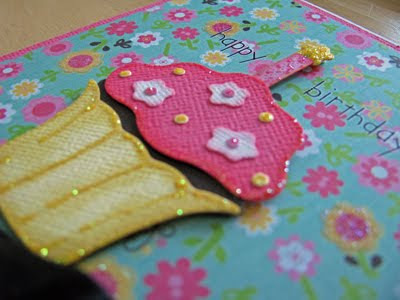 Lots of little shops that specialize in cupcakes, cupcakes on patterned paper, diecuts and embellishments? The Scrapping Cottage not only makes unique dies but also keeps up with the trends. There are 4 different cupcakes to choose from on the Sugar Sweet Valentine's release. 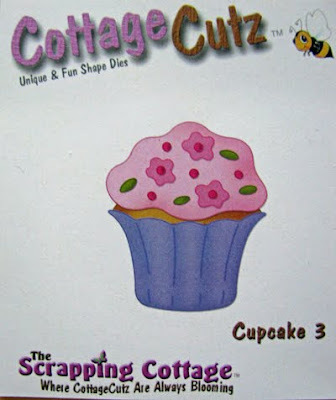 Here is the CottageCutz Cupcake #3. I shaded it with my inks and then added some Stickles which went wonderful with my already sparkly patterned paper. Make them any flavor you want and for any occasion. There are lots of options with this one die or you can get all 4 dies and make your own bakery. This is beautiful! Love the sparkle. Beautiful card. 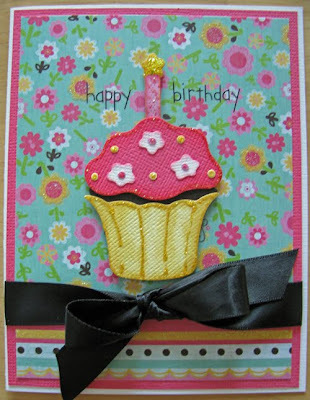 I love your choice of paper and the fun sparkle on your cupcake. Very pretty!! Love the colors and all the little sparkles! !